Bu çalışmada, Amerika Birleşik Devletleri (ABD) ve çokuluslu kurumlar (Avrupa Birliği (AB) ve Birleşmiş Milletler (BM)) tarafından uygulanan uluslararası yaptırımların az gelişmiş ve gelişmekte olan ülkelerin dış borçlarına etkileri ampirik olarak değerlendirilmiştir. Bu kapsamda, uluslararası yaptırım uygulanan 44 ülkeye ait 1976-2014 dönemini kapsayan veriler kullanılmıştır. Elde edilen sonuçlara göre yaptırımlar, hedef ülkenin dış borcunu önemli ölçüde artırmaktadır. Ayrıca, hedeflenen ülkelerin bu yaptırımlara karşı devlet harcamalarını artırması halinde, bu yaptırımların dış borçlanmayı arttırma eğiliminin yaptırım dönemlerinde daha düşük olduğu görülmektedir. Bunlara ek olarak, hedeflenen ülkelerde rejimin türünün dış borçlara etkisi, hükümet harcamalarının durumuna göre değişmektedir. In this study, the effects of international sanctions imposed by the United States (US) and multinational institutions (European Union (EU) and the United Nations (UN)) on the external debts of less developed or/and developing countries are empirically assessed. Our sample includes 44 countries experienced international sanctions over the period 1976-2014. According to the results, the sanctions significantly increase the external debt of the target country. Moreover, if the targeted countries increase government expenditures against these sanctions, it is seen that the tendency of these sanctions to increase external debt is lower in sanctioned periods. Adding to these, the effect of the type of regime in targeted countries on external debt varies according to the state of government expenditures. Aizenman, Joshua, and Nancy P. Marion. 1993. “Policy Uncertainty, Persistence and Growth.” Review of International Economics 1 (2): 145–63. https://doi.org/10.1111/j.1467-9396.1993.tb00012.x. Alesina, A., Özler, S., Roubini, N., Swagel, P. 1996. “Political Instability and Economic Growth.” Journal of Economic Growth 211: 189–90. Alesina, Alberto, and Roberto Perotti. 1996. “Income Distribution, Political Instability, and Investment.” European Economic Review 40 (6): 1203–28. https://doi.org/10.1016/0014-2921(95)00030-5. Ali, Mohamed M, and Iqbal H Shah. 2000. “Sanctions and Childhood Mortality in Iraq.” The Lancet 355 (9218): 1851–57. https://doi.org/10.1016/S0140-6736(00)02289-3. Allen, Susan Hannah. 2008. 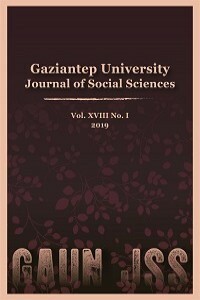 “The Domestic Political Costs of Economic Sanctions.” Journal of Conflict Resolution 52 (6): 916–44. https://doi.org/10.1177/0022002708325044. Allen, Susan Hannah, and David J. Lektzian. 2013. “Economic Sanctions: A Blunt Instrument?” Journal of Peace Research 50 (1): 121–35. https://doi.org/10.1177/0022343312456224. Cortright, D., Lopez, G. 2000. The Sanctions Decade: Assessing UN Strategies in the 1990s. Edited by G. Cortright, D., Lopez. Boulder, CO.: Lynne Rienner. Daponte, B., Garfield, R. 2000. “The Effect of Economic Sanctions on the Mortality of Iraqi Children Prior to the 1991 Persian Gulf War.” American Journal of Public Health 90 (4): 546–52. https://doi.org/10.2105/AJPH.90.4.546. Demirgüç-Kunt, Asli, and Enrica Detragiache. 1997. “The Determinants of Banking Crises: Evidence From Developing and Developed Countries.” IMF Working Papers 97 (106): 1. https://doi.org/10.5089/9781451947175.001. Demirguc, Ash, and Enrica Detragiache. 2000. “Monitoring Banking Sector Fragility : A Multivariate Logit Approach.” The World Bank Economic Review 14 (2): 287–307. Diamond, Douglas W, and Raghuram Rajan. 2009. “Illiquidity and Interest Rate Policy,” no. National Bureau of Economic Research. Diamond, Douglas W, and Raghuram G Rajan. 2012. “Illiquid Banks , Financial Stability , and Interest Rate Policy” 120 (3): 552–91. Dizaji, Sajjad Faraji, and Peter A G van Bergeijk. 2013. “Potential Early Phase Success and Ultimate Failure of Economic Sanctions.” Journal of Peace Research 50 (6): 721–36. https://doi.org/10.1177/0022343313485487. Escribà-Folch, Abel, and Joseph Wright. 2010. “Dealing with Tyranny: International Sanctions and the Survival of Authoritarian Rulers1.” International Studies Quarterly 54 (2): 335–59. https://doi.org/10.1111/j.1468-2478.2010.00590.x. Evenett, S.J. 2002. “The Impact of Economic Sanctions on South African Exports.” Scottish Journal of Political Economy 49: 557–73. https://doi.org/https://doi.org/10.1111/1467-9485.00248. Garfield, R. 2002. “Economic Sanctions, Humanitarianism and Conflict after the Cold War.” Social Justice 29 (3(89)): 94–107. Gibbons, Elizabeth, and Richard Garfield. 1999. “The Impact of Economic Sanctions on Health and Human Rights in Haiti, 1991-1994.” American Journal of Public Health 89 (10): 1499–1504. https://doi.org/10.2105/AJPH.89.10.1499. Hatipoglu, Emre, and Dursun Peksen. 2018. “Economic Sanctions and Banking Crises in Target Economies.” Defence and Peace Economics 29 (2): 171–89. https://doi.org/10.1080/10242694.2016.1245811. Heine-Ellison, S. 2001. “The Impact and Effectiveness of Multilateral Economic Sanctions: A Comparative Study.” The International Journal of Human Rights 5 (1): 81–112. https://doi.org/10.1080/714003707. Hufbauer, G., Schott, J., Elliott, K.A., Oegg, B. 2009. Economic Sanctions Reconsidered: History and Current Policy. 3rd ed. Washington, DC: Institute for International Economics. Kaempfer, William H., and Anton D. Lowenberg. 2007. “The Political Economy of Economic Sanctions.” In Handbook of Defense Economics, edited by Todd Sandler and Keith Hartley, 2nd ed., 867–911. https://doi.org/10.1016/S1574-0013(06)02027-8. Kaminsky, Graciela L, and Carmen M Reinhart. 1999. “The Twin Crises: The Causes of Banking and Balance-of-Payments Problems.” American Economic Review 89 (3): 473–500. https://doi.org/10.1257/aer.89.3.473. Lindgren, Carl-Johan, Gillian G. Garcia, and Matthew I. Saal. 1996. Bank Soundness and Macroeconomic Policy. Washington, DC: International Monetary Fund. Marinov, Nikolay. 2005. “Does Pressure from the Outside Destabilize Leaders on the Inside.” American Journal of Political Science 49 (3): 564–576. Neuenkirch, Matthias, and Florian Neumeier. 2015. “The Impact of UN and US Economic Sanctions on GDP Growth.” European Journal of Political Economy 40: 110–25. https://doi.org/10.1016/j.ejpoleco.2015.09.001. ———. 2016. “The Impact of US Sanctions on Poverty.” Journal of Development Economics 121: 110–19. https://doi.org/10.1016/j.jdeveco.2016.03.005. Oechslin, Manuel. 2014. “Targeting Autocrats: Economic Sanctions and Regime Change.” European Journal of Political Economy 36 (December): 24–40. https://doi.org/10.1016/j.ejpoleco.2014.07.003. Pape, A. R. 1998. “Why Economic Sanctions Still Do Not Work.” International Security 23 (1, Summer): 66–77. https://doi.org/10.2307/2539263. Peksen, Dursun. 2009. “Better or Worse? The Effect of Economic Sanctions on Human Rights.” Journal of Peace Research 46 (1): 59–77. https://doi.org/10.1177/0022343308098404. ———. 2011. “Economic Sanctions and Human Security: The Public Health Impact of Economic Sanctions.” Foreign Policy Analysis 7 (3): 237–51. Peksen, Dursun, and A. Cooper Drury. 2010. “Coercive or Corrosive: The Negative Impact of Economic Sanctions on Democracy.” International Interactions 36 (3): 240–64. https://doi.org/10.1080/03050629.2010.502436. Scheresberg, Carlo de Bassa, Edoardo Grillo, and Francesco Pasarelli. 2017. “Sanctions and Incentives to Repudiate External Debt.” Collegio Carlo Alberto. 505. Weiss, T., Cortright, D., Lopez, G., Minear, L. 1997. Political Gain and Civilian Pain: Humanitarian Impacts of Economic Sanctions. Boulder, CO.: Rowman and Littlefield. Weiss, Thomas G. 1999. “Sanctions as a Foreign Policy Tool: Weighing Humanitarian Impulses.” Journal of Peace Research 36 (5): 499–509. https://doi.org/https://doi.org/10.1177/0022343399036005001. Whang, Taehee. 2011. “Playing to the Home Crowd? Symbolic Use of Economic Sanctions in the United States1.” International Studies Quarterly 55 (3): 787–801. https://doi.org/10.1111/j.1468-2478.2011.00668.x. Wood, Reed M. 2008. “‘A Hand upon the Throat of the Nation’: Economic Sanctions and State Repression, 1976-2001.” International Studies Quarterly 52 (3): 489–513. https://doi.org/10.1111/j.1468-2478.2008.00512.x.